If your correspondence goes unanswered, use this complaint letter to solicit a response. 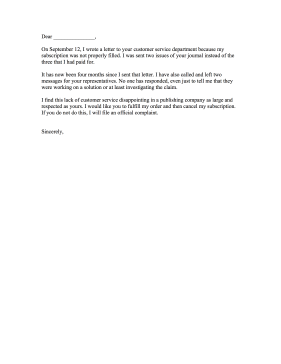 On September 12, I wrote a letter to your customer service department because my subscription was not properly filled. I was sent two issues of your journal instead of the three that I had paid for. It has now been four months since I sent that letter. I have also called and left two messages for your representatives. No one has responded, even just to tell me that they were working on a solution or at least investigating the claim. I find this lack of customer service disappointing in a publishing company as large and respected as yours. I would like you to fulfill my order and then cancel my subscription. If you do not do this, I will file an official complaint.